Today I’ve taken a closer look at Harvil foldable magnetic exercise bike. This particular bike has been on the market for some time now and I was lucky enough to review it at my friend’s house. Harvil company is known to replace your items immediately, if they arrived battered or in damaged conditions. This information alone tells you that you can take them seriously. But let’s get back to the bike and its features. As the name suggests, it comes with a 10-level magnetic resistance system. The bike is foldable and easily storage-able with the help of two small wheels at the front of base. It comes with a compact digital monitor that displays distance, speed, time, calories burned and heart rate and it also comes with a pulse rate monitor, which is located on the handles. The handles themselves are padded and the bike’s seat is cushioned and adjustable. The pedals have anti-slip design and come with sturdy & strong straps. The assembled and unfolded dimensions are 26.4 L x 20 W x 46 H inches, the weight is 44 pounds and maximum support weight is 330 lbs. According to my friend, the assembly was quite easy with the provided instructions and it took him alone about 20 minutes. All the necessary tools were included. The bike itself looks pretty great and it’s really small. The seat is quite comfortable indeed, although one thing which I noticed is that the holder of the seat is made of quality plastic. One would expect steel frame there. The padded handles are pretty standard; however, the pulse rate monitor is well placed and does seem to work quite accurately. The added backrest needs to be mounted with bolts, which can take a while, but it is comfortable. The small monitor automatically turns on once you start pedaling and while you cannot switch distance to kilometers, it does do the job. Now regarding the resistance level mechanism, I’m pleased to say that it’s easily reachable and can be adjusted while pedaling. The 10-level mechanism should be sufficient for all kinds of people. The anti-slip pedals are pretty sturdy and the straps as well. Not much to add here. That’s basically all she wrote. 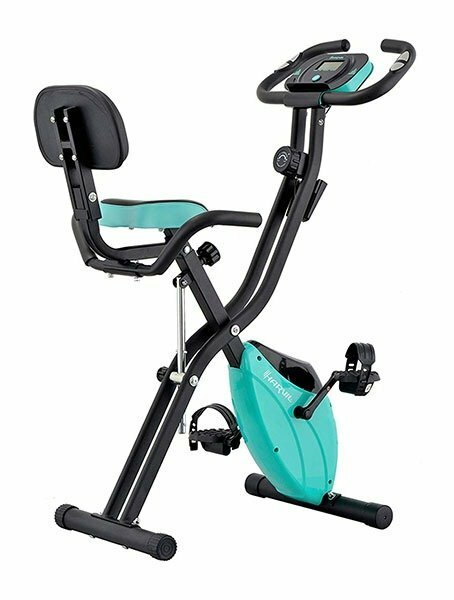 Harvil foldable magnetic exercise bike is a small, sturdy exercise bike that does not take a lot of space. The resistance mechanism is great and the numbers on the display are accurate. However, the manufacturer advertizes 330 lbs weight support. Honestly, I can imagine the bike would hold that much, but then again, I weight 160 lbs and my friend 200 lbs, so we can’t test that one thing. In any case, personally, I’d say the bike is worth the money, but make sure to check our other review guides, like Ideer Life exercise bike review.